Can someone get this man a brush? And then there’s his tender, delicate, quavery, whispery voice, which is about unlike the powerfully, yawping vocal style that we’ve come to expect from our rock stars. He’s the unapologetic un-rock star. Because of this, he does seem like someone you could sit down and talk to about life and Harry Potter novels and what’s your favorite Arrested Development episode? and are you a fan of opera, Sufjan? and wasn’t the Social Network so good? and are you hydroscopic? and whatever. He seems like your pal, Sufjan. The artsy one with the weird name and the girls all like him and he’s really into World of Warcraft or something. We should start a band. He is probably the most gifted songwriter and composer of his generation. Look, I’m just a simple inorganic compound that’s essential to life. I’m not a musicologist and I don’t work for pitchfork.com, so I’m probably not qualified to make a pronouncement like this, but I do listen to a LOT of music, and I think that Sufjan is has an unsurpassed combination of talents for melody, arrangement, lyricism, and tone color. The last minute or so of “The Predatory Wasp of the Palisades” may be the most beautiful and heart-breaking music anyone’s written in the last twenty years. Add to that his relentless creativity, and I don’t think any current popular musician can match him. *Okay, so he’s released about 10 albums since Illinoise, but including one earlier this year, but it’s his last real album. **More on that to come in a later post. ***It also mentions rivers and lakes, so, you know, bonus points there. Oh, yeah, then there’s this. So, now that we have it, what do I think? Well, it’s really, really good. Probably one of the five best albums of this year. It’s haunting, beautiful, dramatic, challenging, intensely personal (almost suffocatingly so), and different from anything else your likely to hear any time soon. It’s not really at all what I expected. With a name like Age of Adz, I expected the album to be a sort of sweeping epic about the commercialism of our times and how we live in the age of ads and we’re caught in a cycle of consumerism and materialism and buying things we don’t need. Instead, it’s almost uncomfortably, voyeuristically, intimate. Every song is a conversation, and they feature confessions of love, angry pleading, words of regret, and words of affirmation. It seems to take place in a cozy room with only two people, shutters drawn and doors closed, with one person laying his soul bare before the other. Far from an epic about modern society, it seems unconcerned with the goings-on of the world at large. "I think that came out wrong." In “I Walked,” Sufjan tries to explain himself although he knows it’s too late and he’s “already dead” to his beloved. “Bad Communication” is about, well, bad communication, and serves also a reprise of “Futile Devices.” Sufjan begins “I’ll talk but I know you won’t listen to me,” and then tries, in different ways to say I love you. Despite these difficulties, and the inevitable violence that we do to each other when we try to communicate (the image of lovers stabbing one another appears at least twice in the album), Sufjan is committed to living with, and striving to express himself to, his beloved. He wants to “get real, get right with the Lord,” he “want[s] to be well (and he’s not f-ing around),” and he’s going to “give it all he’s got.” *I should really say “the narrator,” but, given the intimacy of the songs, I think it’s safe to assume Sufjan identifies himself with the narrator. 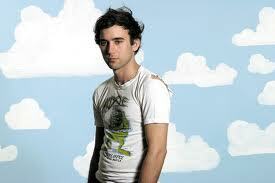 The album is also about Sufjan’s own journey from the young genius who wrote Illinoise to the older artist he is now. After all, he had declared himself retired from popular music, and, as you can see in this interview with Paste Magazine, he was pretty burnt out from the attention Illinoise garnered. Who is he struggling to communicate with if not his own audience? If he really “no longer has faith in the song” as he said, then what new form can he find to speak to his audience? An audience he loves but, at the same time, feels wounded by and struggles to communicate with. Age of Adz is Sufjan’s attempt to reconcile with his listeners, laying bare his impossible soul to us and asking us if we can still love him. I say, welcome back, big guy. Ultimately, I think this is a transitional album for Sufjan. Brilliant as it is, it doesn’t match the quality of Illinoise. Age of Adz has no song which approaches the beauty and greatness of the best five songs on Illinoise. Sufjan is at his best as a songwriter when he’s telling stories, and that’s what Illinoise was about. Age of Adz, on the other hand, is about raw emotion. It’s Sufjan cleansing his system and finding a new way to communicate with his beloved. Wheat, you glutenous grain, you say that Age of Adz reminds you of OK Computer, but I see it more as Sufjan’s Kid A. With OK Computer, Radiohead created a masterpiece, but they found that they had gone as far as they could within the template of a rock album. So, rather than forging ahead, they hooked a left and went on a different path with Kid A. * I think Sufjan found himself in a similar position after Illinoise. “Am I really going to grind out a bunch of albums full of flutes and violins and flugelhorns and choruses for the rest of my career?” Nope. Time to hook a left and do something different. "Did I miss my exit?" I definitely hadn’t seen (heard?) Wheat’s Wizard of Oz/Dark Side of the Moon thing coming, though I do think it’s odd (no pun intended) that Adz is pronounced ODDS, which, granted, is pretty close to Oz. I may have to check that out. I think if I was a super music genius I’d make an album that secretly synced up with Dr. Strangelove. That’s a good question, which movie would you secretly sync up your mind-blowing album to if you were a super music genius? This is neither here nor there,* but I thought it strange that, in “Age of Adz” (the song) Sufjan, after talking about eternal living, says that he will rot when he dies, when, kind of the point of Christianity is that we will not rot or that we will at least be given new bodies after we do rot. I don’t know, it just seemed like an odd thing to say in a song affirming eternal living and giving it all you’ve got and whatnot. Like I said, neither here nor there. * Where is it, then? Only in my bizarre brain, which is definitely neither here nor there. I don’t think I’ll ever like the autotune. I try to keep an open mind about these things, but, when I heard the autotuned section in “Impossible Soul,” I about puked. I think it can’t overcome the taint of Kid Rock and Lil’ Wayne in my mind. I really wish Sufjan had broken “Impossible Soul” into five parts. The first movement is the best song on the album, but, sadly, you can’t just enjoy it without the other 20 minutes. The fourth movement is also terrific, but I think the other three are subpar. Okay, that’s about a tenth of my thoughts on the fascinating Mr. Stevens and his album. I’ll save you from having to sort through the rest of them.